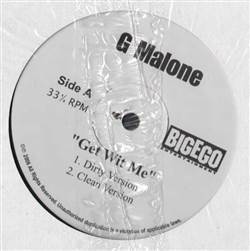 G Malone - Get Wit Me 12"
HIP HOP, Big Ego, USA, 2006... With Get Wit Me (Dirty), Get Wit Me (Clean), Get Wit Me (Inst), Get Wit Me (Dirty Acappella). Krumb Snatcha - Afta The Club 12" Toddy Tee - Just No Good (I Can't Help My Self) 12" Mudkids - Freekya / Mash It Up / Water To Earth (H20) 12" K.T. - I Tried To 12"
Double H - So Serious / Freak Like Me 12" Jewel T - Driftin' 12" A.G. / Design / Grip Grand - Look Records Sampler 2005 12" Dirty Dawgz - Dirty Dawgz / Damn 12"